I wouldn't exactly call our apartment "done" yet (though, is it really ever??) but I did want to share this little nook at the end of our entryway hallway. I had lofty dreams of a big plush bench here and tons of coffee table books and flowers and artwork, but this will do too. It's getting there! This awesome bench is from The Upper Rust (a haven for antiquey goods and props, not to mention three blocks from the apartment), and I believe it was made from a beer barrel. These two NYC watercolor sketches are from the talented Suhita of Sketch Away. When we were all cooped up inside on the day of Irene's supposed rampage, I went on an blog surfing binge and came across her work, which I immediately HAD to have. J is all about getting original artwork, so we got these created for us. They were remakes of this and this, both of which are super affordable prints. Suhita mentioned that the cool thing about these two was that they were sketched from the same place in the city. All it required was a turn of the head. The third sketch is by the awesome Charrow. We came across her work at the Joe Coffee on 13th and were instantly smitten. This particular print is called "Hydrant Jungle" (you must see it up close as it is terribly cute). Your place is terribly cute, Alice! Like a page out of a catalog. Cute nook and I love the illustrations. I would LOVE to see this first thing as I walk through my front door. nicely done, lady! Kudos on the nicely decorated space; love the details. This is so airy, so nice...! I always like a place with nice entry. Make me want to re-done my entry tooo! Bridge and I are chatting right now about how jealous we are of this here nook. So cool! I love that you guys support your local artists too. I love this nook..It looks serene. dang, alice! 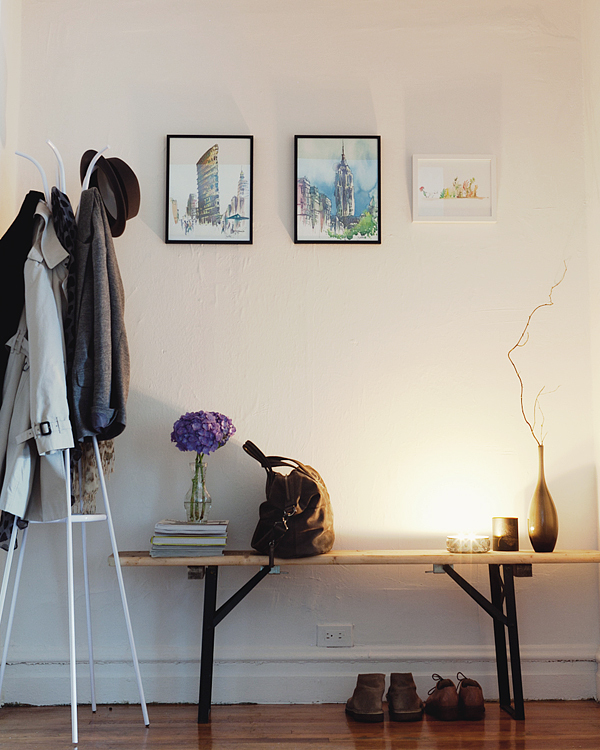 it's all magazine-like inside your apartment. sweet looking nook of yours.